Just one year after leaving Oscar Tiye, Amina Muaddi is making a triumphant return to the world of shoes. Having created every collection for the Italian high-end shoe brand since co-founding it in 2013, she departed Oscar Tiye after completing the Fall/Winter 2017 Collection. However, she still creates the footwear for French couturier Alexandre Vauthier. The talented fashion designer, who lived in Jordan and Romania before moving to Italy, was fascinated by shoes at a young age. She even used to walk around the house in her mother’s heels as a child. Her inspiration comes from her Middle Eastern heritage and close female friends like Attico co-founders Gilda Ambrosio and Giorgia Tordini. 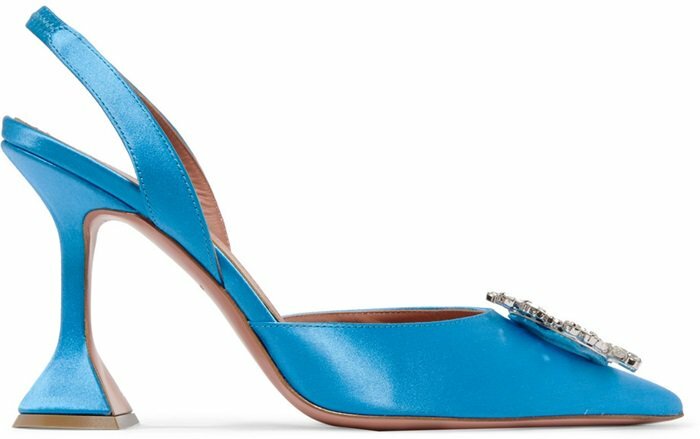 The sophisticated debut collection includes 45 sleek stiletto pumps, mules, boots, and sandals with lustrous textures and light-catching embellishments. 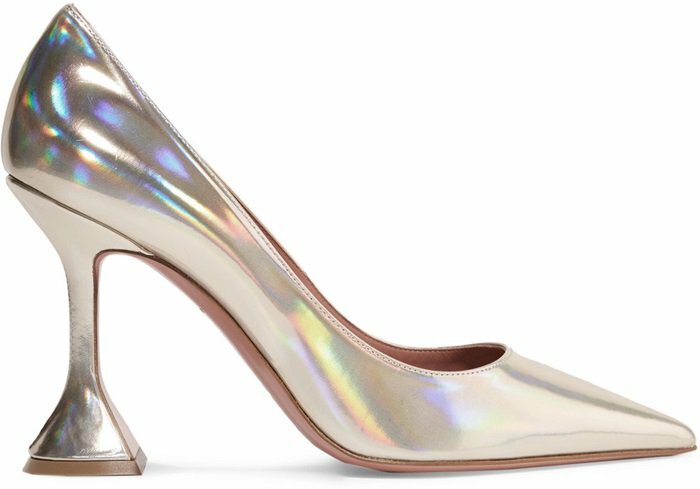 Below are just 10 of Amina Muaddi’s best shoes that you can purchase at Farfetch and Net-A-Porter! 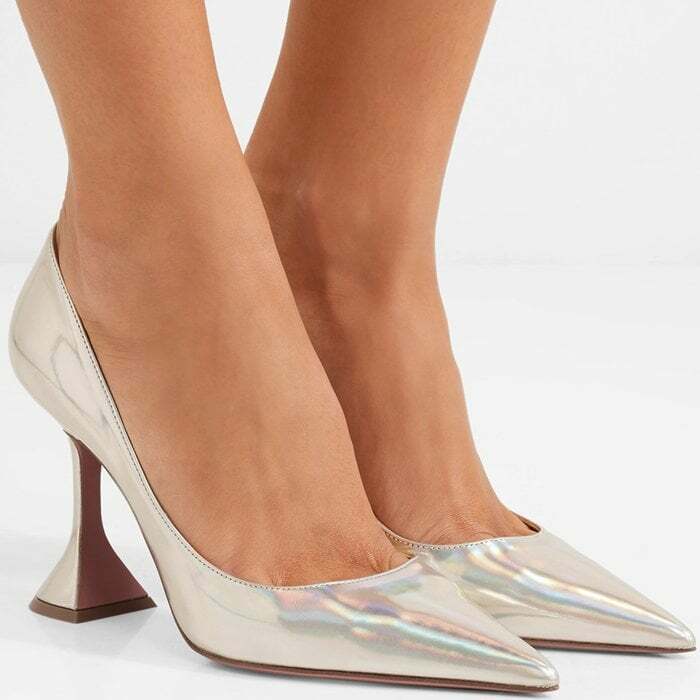 Take note of the flared signature heel on Amina Muaddi’s ‘Ami’ pumps that have been made in Italy from holographic leather with a sharp pointed toe. 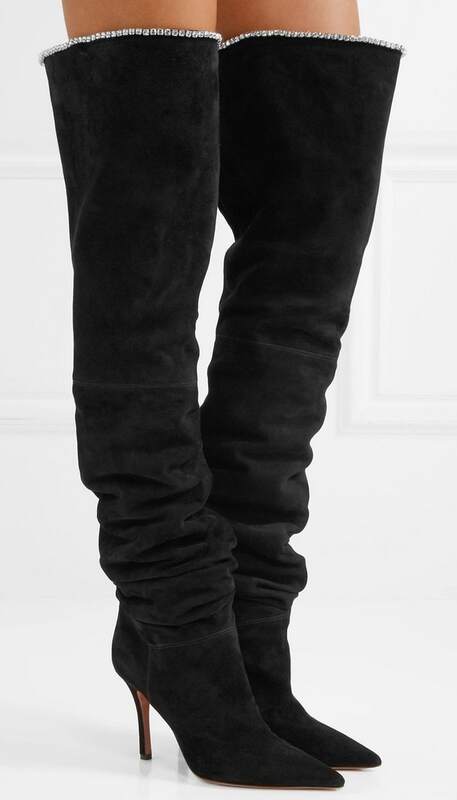 These black suede over-the-knee ‘Barbara’ boots are lined in buttery leather. They have a pointed toe and luxurious crystal-embellished cuffs. 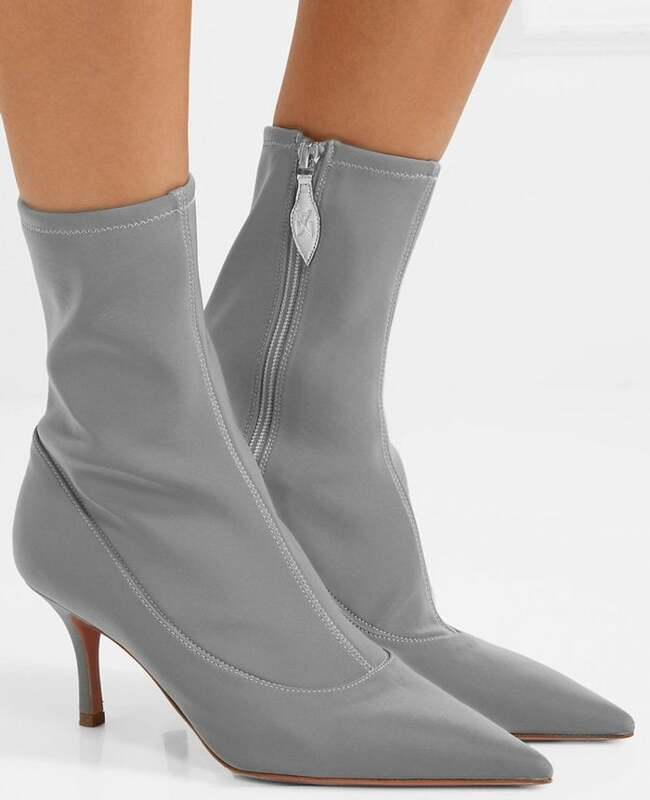 These ‘Barbara’ over-the-knee boots have been made in Italy from white smooth lamb leather and set on a 70mm stiletto heel. 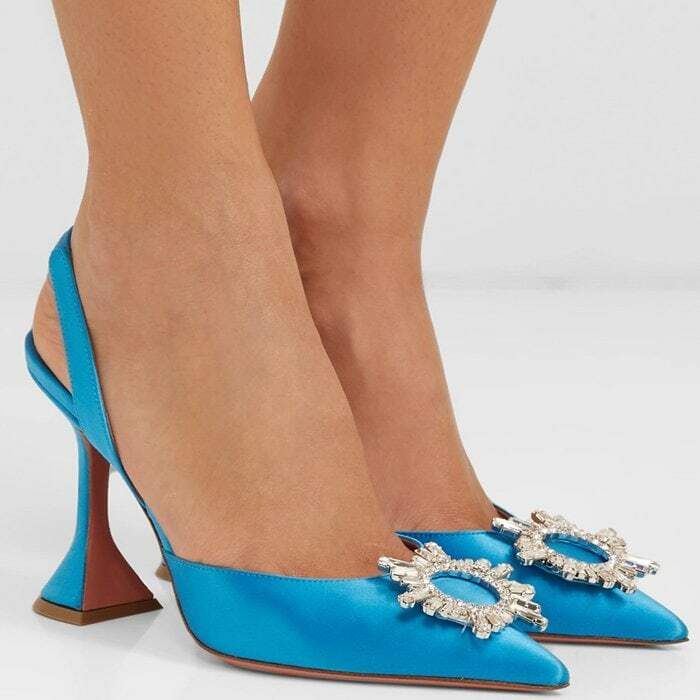 These bright smooth turquoise satin ‘Begum’ pumps feature elasticated slingback straps. The toes are topped with glistening crystal brooches inspired by Art Deco mirrors. These vibrant pink satin mules feature straps and edges that are dotted with glistening Swarovski crystals. 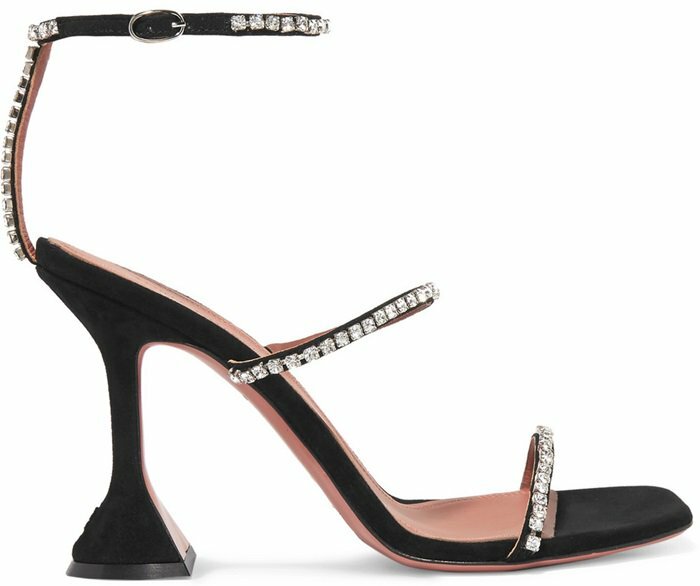 These smooth black suede sandals are decorated with Swarovski crystals and set atop sculptural heels. These black patent-leather point-toe boots have a slouchy silhouette that grazes mid-calf. 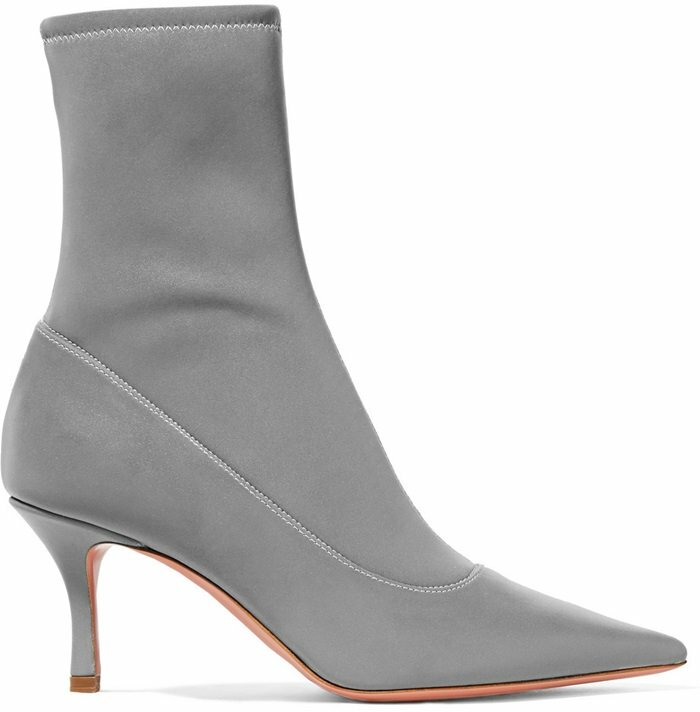 These sleek boots are set on a 70mm stiletto heel and made from reflective stretch-knit fabric that catches the light at every angle. 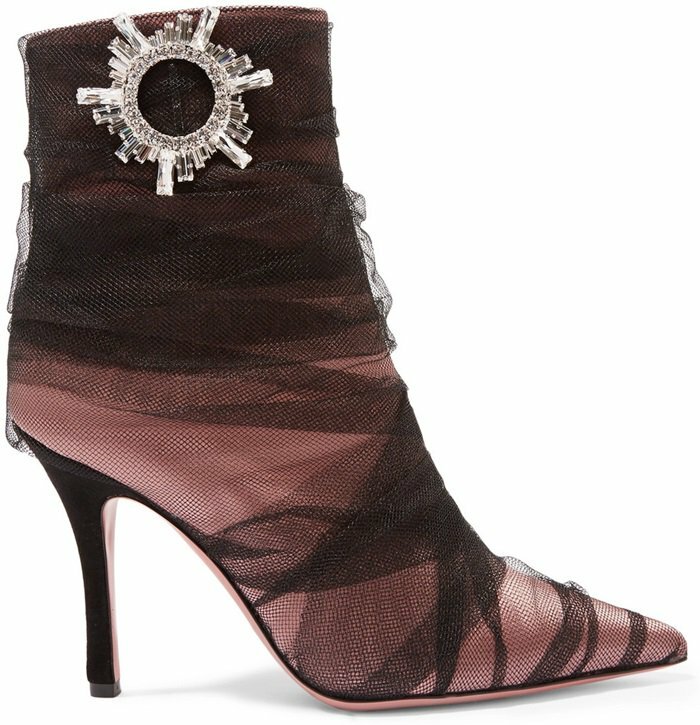 These ‘Tessa’ boots have been impeccably made in Italy from antique-rose satin that’s lined in leather and covered in ruched tulle. They rest on a contrasting suede heel and have a crystal-embellished brooch at the ankle. 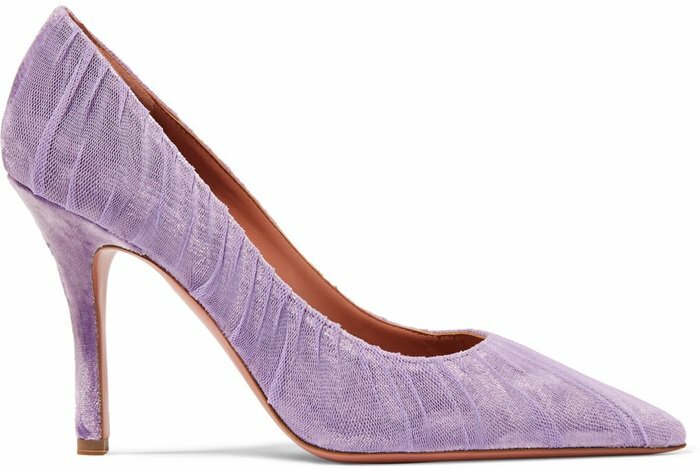 This pointed pair has been crafted in Italy from sumptuous velvet and overlaid with delicate tulle.